Řešení na klíč je plně repasovaná převodovka 8:33 (412) diferenciál nebo 8 :31 (3.875) diferenciál. Tento typ diferenciálu je velmi vyhledávaný pro kohokoli, kdo má postavený motor 1600cc nebo vyšší obsah. Vzhledem k poměru který je delší, je dosahována vyšší maximální rychlost. Všechny repasované převodovky jsou dodávány bez upevňovacích silentbloků, spojkového ložiska a oleje (převody plně synchronizovány). Převody jsou vybavena speciálním kolečkem, která zajišťují synchronizaci a přenos síly na ozubená kola převodovky. Veškerá ozubená kola jsou repasovaná speciální metodou. Reconditioned gearboxes, the gearbox does not last forever, it can over time various parts wear making it difficult or switching noise occurs while driving. You can get the gearbox open itself and remedy the defect but this is often not an easy task. 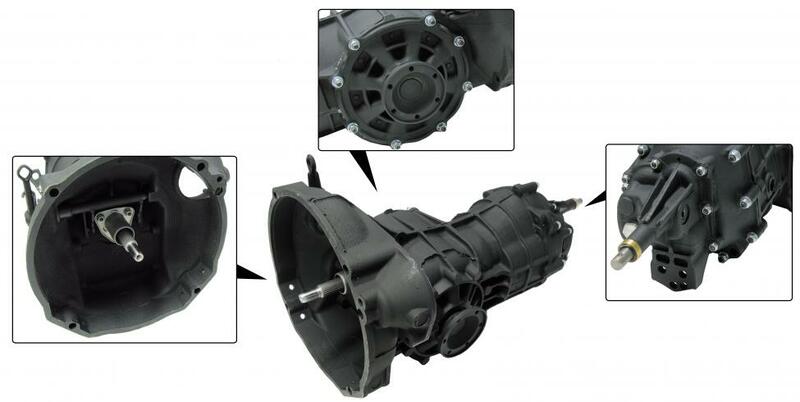 A turnkey solution is a fully reconditioned gearbox with 8: 33 (412) differential whether you choose a container with an 8: 31 (3.875) differential, the latter was mounted by Volkswagen for the versions that are standard with a 1600 cc engine were equipped. This type of differential is highly sought after by anyone who afterwards a 1600 cc or a heavier engine has built. Because of this ratio are all gears longer, so there is also a higher top speed is achieved. The speed is lower than before less engine noise in the interior entails at a certain speed. If one now 1200.1300 or 1500 cc engine is also fitted you can without problems also 8: 31 (388) gearbox mount, keep in mind that the traction will be a lot less and you have to go up more honors the desired speed is reached .. All remanufactured gearboxes are supplied without mounting rubbers, thrust bearing and oil. All transmissions are fully synchronized. If you have a car t / m the year 7/1960 also it is possible to be fitted, take then the conversion adapter extra. revision note: The gears of various gears are equipped with an extra cog that ensure the synchronization and power transmission from the gear to turn. In many reconditioned gearboxes are missing some teeth in these sprockets while the original is not the case. This adjustment, however, deliberately done to avoid. Switching problems The sprockets are original made ​​with thin and thick teeth on a wreath. Only the thicker teeth are taxed and are subject to wear. When these teeth are worn out too far, the container will tend to jump out of gear, or will be able to be. Not more smoothly switched to the acceleration In order to prevent this, the thicker teeth during the overhaul removed, leaving the remainder of the thinner, even if new, teeth, these tasks can be taken. Of course, this only happens if these teeth have worn down until they can be once a gearbox-life problems go. Not guaranteed New sprockets mount is not an option because they are simply not get. The "new" transmission is not weaker than the original, as the number thicker teeth always equal to or lower than the number of teeth thinner. This method is used by many companies overhaul and is now an accepted way to solve this problem. quoted are applicable to all gearboxes Beetle and Karmann Ghia from 8/1960 and later. Zadní polyuretanové silentbloky převodovky pro vysokou zátěž šedé pár.